Alert is a good feature in SharePoint 2013. It allows us to sends an email notification or a text message whenever changes are made to the content in a site, including changes made to list items in a list. The alerts can be set for a list, a library, a folder, a file, or a list item. 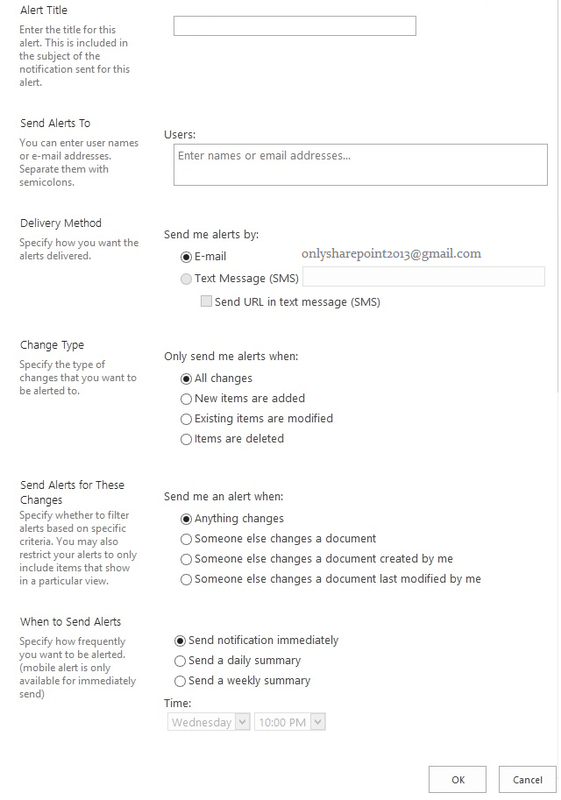 Through alerts you can set to whom the alert will be send. Also you can set the type of change for which you want an alert to be initiated. You can specify when to send alerts. And also you can set the alert frequency. - First Open the list, document library or discussion for which you want to setup the alert. - give a title for the Alert. - you can enter the username or email address to which you want to send the alerts.